Adam Trahern sat on his horse, alone, his blue heeler, Murray, sitting beside him as he studied the ranch lands spread out before him. He was at his favorite lookout point where he liked to come to watch the sunset. He often became so caught up in keeping the ranch going, that he missed coming here. This place renewed his spirit, helping him keep going when the economy, or his neighbor, or both, proved difficult. Now he had a new problem. One which could change his life for the better or completely destroy all hope. If only he would figure out which way to proceed. He had to control the situation with Grandpa Davies, his elderly neighbor. If he couldn’t, several lives would be ruined, including his. His cell phone rang and he reached into his pocket and brought it out. Cell phones were a great invention, but they never let you rest. You were almost always reachable, unless you turned the irritating thing off. The local ranchers with mountain pastures, were losing beef, and had banded together to watch for strange vehicles, anything large enough to put a calf into and haul away. They’d asked Adam to be their eyes, since his ranch lay on a ridge of its own above the rest. He had a large telescope at home which he could train on a parked vehicle. Sometimes he could even read the license plate. He dismounted and swept the road. Nothing at first, then he saw it, a small panel truck coming up the ridge road, past the few trees that grew there. Here in the Blue Mountains of northeastern Oregon, the roads were on the ridges, the heavy growth of trees covering the valleys. It made it easy to see who was traveling the roads, especially since he’d invested in high-powered binoculars. This truck stopped and a dark-complected man got out and looked to be taking pictures. Another man with light brown hair joined him and they stood talking and pointing around. The dark-complected man was taller than the other, but Adam had no way of telling how tall they really were. They were dressed in jeans and T-shirts, the standard ranch wear. He’d never seen them before. They could be there for many reasons, one of which was to steal cattle. Or they could be hunters, scoping out the area for bow hunting. Or they could be loggers or government men. They got into the truck and continued up the road, along the ridge and out of sight. If they were taking cattle, they weren’t doing it right now. This was the fifth truck he’d checked on today, from different parts of his ranch. Most had driven right along. One other had stopped and the people got out and walked to the fence line. He had decided they were taking a bathroom break and wrote them off as possibles. Other vehicles, such as jeeps and cars traversed the mountain roads, but Adam couldn’t watch them all. One of these days someone would luck out and catch the men doing the stealing. Robbers usually always got caught, sooner or later. The longer it took though, the more damage they did. Many of the ranchers were barely hanging onto their property. This was grazing land, not farming land. The soil was shallow and rocky. You could lose a weak animal to a predator, or an accident, or the winter. This hurt you, but not as much as a thief. Thieves were a different breed of cat, taking the best you had. Your breeding stock. The sun set in a spectacular blaze of flashing lights, and, as he watched for it, a splash of iridescent blue formed across the skyline just before the sun went down. He put his binoculars away, remounted and rode home through the pastures. It wasn’t that far, only twenty minutes. He was soon at the corrals, getting there at about the same time Johnny rode in. What a mess. What was he going to do? “I don’t know what I should do.” Joanna Davies threw up her hands. She sat with the other women in the Sisters of Spirit group, in a rare moment when they were all together. This time they had gathered at the Sheraton Hotel in Seattle for the double wedding of Alison and Chantal, who were marrying their two Superbowl champions, Josh Logan and Jake Earle. Of the original group, only Stormy and Jo were unmarried, and Stormy’s wedding to Kyle was set for next month. He was there with them, enjoying his introduction to everyone. Jennel and Zack were there with their three-year-old girl and year-old boy. Ellen and Jared now had a two-year-old boy. Perri and Hugo showed up with five-month-old twin boys. And Angie and Ryan proudly displayed a newborn baby girl. Connor was on his ship, but Mary was there, confident and smiling, being one of Alison’s bridesmaids. Hugo had paid the wedding photographer to take photos of all the women together, then the group with their husbands and children, then each family separately. He and Perri had decided to do it before the group became so involved with other things that they couldn’t get together again. The Sisters had been using social media to keep in touch, but nothing could beat a face to face chat. They had gathered in the lounge to visit while waiting their turn to be photographed, but Jo’s cell phone kept ringing. “Who’s boiling the pot?” Stormy asked, who knew best how to make a pot boil without using any fire. “So, did it?” Angie asked. “Why would he do that?” Stormy asked. “But why do you feel like you have to stay away?” Robyn asked. “How long have you been away?” Jennel asked. Stormy stood up, but tarried long enough to hear Jo’s answer. “Oh, wow, how did that happen?” Perri asked. “He might be using his condition to control everyone,” Ellen said, who had come from a demanding family. “What if Karen elopes?” Perri asked. “Now that would be a big shock. It would probably kill him,” Jo said. Jo thought a moment, picturing the handsome rancher before answering. It would be difficult after not speaking to him for seven years, but she could approach Adam. Still, could she trust him not to antagonize her grandfather? They all laughed, and Jo shook her head. It wasn’t anything like that. She had had nothing to do with Adam since the incident in high school. “If you still want to leave,” Robyn added. The rest of them nodded. Stormy returned to the lounge and motioned her cousin to be next. Perri stood up, paused and said, “Go home, Jo. You have a family who loves you and should be part of your life. Go help Karen. See if you can straighten out your grandfather’s thinking. If you don’t go, I think you’ll be sorry you didn’t try.” She left the room. The others nodded. “Give it a try, Jo.” “Yes, do.” “Stop avoiding it,” they said. “Text Karen. Tell her you’re coming. Then you can turn your phone back on,” Ellen said, and they all smiled and nodded. Jo wondered if they had any idea what she was getting into, and decided they probably did. “Right. Everyone knows him.” Karen started the car and pulled out of the parking lot. “And that is nothing we can prove right now, either,” said Jo. “That would still give him a heart attack, when one of us, or one of your friends, happens to mention it. We have to try something else, so he gets used to it gradually.” She looked at her sister. Karen wore her brown hair long and falling forward on her face to hide the scars she had gotten as a child. Jo remembered the incident well, as she had been the one carrying the pan of boiling hot pasta that her little sister had reached up and grabbed, spilling it onto her arm, face, and chest. Their screams had brought their mother into the kitchen. Karen had just started kindergarden, and the disfiguring scars had required lots of surgery to make most of them go away. She had turned from an outgoing youngster into a shy child, trying to hide her face from her classmates’ cruel comments and people’s reactions of shock when they first met her. She had missed two whole years of school, and would have been a grade behind the others, but Jo told their parents how the kids were teasing Karen. Their mother took them out of school right away and home-schooled both of them during Karen’s recovery, including a year before Karen felt ready to return. It was at this time that Jo developed her love for math and astronomy. She completed three grades during the two years, and returned to school ahead of her classmates. Jo continued to excel at school, taking college courses in high school and getting her master’s at twenty-three. She always felt younger than everyone in a group, even the few times when she wasn’t. “Promise you won’t leave. You don’t have a job to go to, do you?” Karen was almost begging, and Jo didn’t want her to feel that way. “No. No job. I put out applications, but there is not much hiring going on right now.” And although she had worked during her school years to help supplement her scholarship, she was now completely broke. She had used up all her savings and had had to borrow some money from Jennel to pay for the flight home, since her round trip ticket took her back to Virginia. “I’ll have to look for a job around here,” she added, wondering how a degree in meteorology could be used out here. She had planned to eventually work for a radio or TV station, reporting the weather. But she had learned it might take time to get a job doing that. A home of her own. It was what Jo wanted, too, and she wouldn’t deny her sister the happiness she deserved. Jo barely knew Johnny, but anyone who could see past the scars and make Karen’s eyes glow when she talked about him, ranked high in Jo’s mind. The Sisters had been right. It was time she went home and confronted her grandfather and got him to face facts. Somehow. She looked out at the scenery passing by. Big sky country. Montana claimed the title, but any semi-arid country where the buildings and trees dropped away and you could see from horizon to horizon was big sky. A feeling of relief struck her as it always did, for big sky meant home. Unlimited vistas. As she had done all her life, she envisioned herself riding beside the car, just not on the road. Her imaginary steed took her down each gully, up each hill, jumping each fence that appeared. Like many narrow country roads, there was no center line and not much shoulder. When you met another car, both had to slow down and move over. They passed the corner where Grandmother Anna had died. The family had put a small, white, wooden cross there, and replaced it every year. It never failed to remind Jo of Anna, for she had been close to her grandmother. Then as they climbed up into higher mountain country, Jo thrilled at the sight of the scraggly trees that clung so tenaciously to the rocky volcanic soil. Not beautiful to some people, but to Jo it was home. Home. Her spirit sang within her and she wondered why she had stayed away so long. Perhaps, now that she was older, she would be able to handle her grandfather. She had blindly believed him when she was little, and stayed loyal to him through high school. It wasn’t until she was in college and got away long enough that she began to understand how controlling he was. Yet each time she had returned for a few days, she had fallen into the same old habits. It was easier to avoid the topic of Adam and his family than to make Gramps angry. Karen turned the car up the rocky driveway towards the ranch house, which came in sight as they rounded the corner. A two-story farm house, it had endured almost a century of mountain weather. Jo’s white Appaloosa, Paca, stood by the home pasture fence, her dainty head lifting as the car drew near. She grabbed her few belongings and followed Karen inside. “How has his heart been?” Jo asked. Jo dropped her pack inside her room, yanked some old clothes out of a drawer, changed, kicked off her sandals and pulled on her boots. She grabbed a jacket as she headed out the door, and then ran down to the barn, where she collected some oats in a pan, Paca’s bridle, and a brush. She ran out to the corral and found the little horse waiting for her. “Could you tell I was in the car?” she asked. Paca nuzzled her, jamming her nose up to Jo’s body to get her scent, then pressed her head against Jo and held it there. Jo stroked the horse’s neck and behind the ears, then put on the bridle after Paca finished up the oats. “Want to go?” Jo asked, but Paca was already headed out the gate, and Jo had to hurry to keep up. A quick brushing, then Jo saddled up. Paca left the barnyard at a dead run. The Appaloosa tore up the mountain road toward the trails Jo always took, jumping six-inch ditches across the way like they were wide and four feet deep. Jo gave Paca her head, enjoying the horses’ delight in being out of the pasture and moving again. She let her run for awhile, then pulled her in. She stayed on the road until she got to one of her father’s wire gates leading into a mountain pasture. It was late in the afternoon by now, and if she hurried, she could get to her favorite lookout point in time to watch the sun go down. No matter that it was on Adam’s land. That had never stopped her from going, as it was the best spot of all. She opened the wire gate, let Paca through, then stopped. She’d come out totally unprepared. Except for her jacket tied on behind the saddle, she had no knife, no matches, no gun. She put her hand in her pocket. She hadn’t even remembered to take her cell phone out of her purse. Still, it wasn’t that far to where she wanted to go. She could even walk home, if she had to. What could go wrong on a beautiful day like today? She closed the gate, remounted, and rode off down the trail. If she hurried, she could be back while there was still light in the sky. Sitting relaxed in the saddle, Jo gave her Appaloosa a free rein as she cantered toward the corner of her father's mountain pasture. She breathed deeply of the fragrant Ponderosa pine, enjoying anew the wide open spaces. She could easily reach the lookout point before sunset. The viewpoint could only be reached by going through a second gate onto Adam Trahern's land, but Jo had never let that stop her. She had ridden these Oregon mountain trails ever since she was old enough to walk and knew every wire gate within a ten-mile radius. Even the fact that the land belonged to her grandfather's sworn enemy did not make her hesitate. The Ponderosas opened up ahead of her into a wide clearing. There the narrow trail cut through a patch of stirrup-high brush, as dense as any hedge. In the thickest part of the brush, Jo spotted her father's old Hereford bull, face to face with a younger bull that had to belong to Adam. They had destroyed a large section of the barbed wire fence and were circling slowly in the wreckage, pausing now and then to snort loudly and paw the ground, throwing scoops of dirt over their massive backs before charging each other. Jo pulled Paca down to a fast trot as she rode closer. Sounds do not carry well through timber, so Jo had not heard any noise as she approached. she thought, looking angrily at the younger and stronger animal. Probably a descendant of Sir Galahad. He had the size and strength of that line, which was well known in the area. He would surely hurt her father's old bull unless she intervened. They faced each other with wild eyes, heaving flanks and lowered heads. The two could critically injure each other if allowed to continue. Her father could not afford to lose his breeding bull. She had to separate them. Why had Adam put his animal into the adjoining pasture? He should have known there would be trouble. Had he done this just to provoke Gramps? Adam and her grandfather were like two bulls themselves, always circling warily around each other, ready to charge. Jo had attended a college clear across the United States to avoid being caught between the two. After a brief glance at her, the bulls resumed their battle. Upset with Adam for creating a situation where there was bound to be a fight, she did not pause to thoroughly check things out. She yelled loudly and waved her arms, then jumped Paca into the patch of dense brush. She was used to handling cattle and knew the bulls would move away from a horse. They plunged sideways, startled at the unexpected intrusion, but went no further. As her mare bounded through the brush in short little leaps, Jo yelled again. This time, with a toss of their heads, the two combatants raced off into the woods, each going a different direction. Then Paca slammed to a stop, stiff-legged, throwing Jo up against the saddle horn. She caught herself by reflex and eased back into the seat, alarmed at Paca's unusual behavior. The Appaloosa stood ridged, trembling violently. "Come on." She urged Paca ahead by rocking her own body forward and squeezing with her legs, but the mare refused to move. A silver flash caught Jo's eye and she glanced down, right into a mass of tangled barbed wire—all that remained of the fence after the bulls' fight. Camouflaged by the stirrup-high brush, the treacherous strands rippled threateningly around Paca's legs, the shimmering coils as deadly as any poisonous snake. Fighting down the urge to panic, she looked to the other side. Death stared back at her as several swaying loops surrounded her horse's legs. Jo held her breath as she assessed her chances. Barbed wire could kill, holding a horse and rider prisoner while the terrified animal destroyed them both. Paca hadn't been ridden since Jo's brief return two years ago during Christmas vacation and had acted like a young colt earlier today. If the mare fought the wire, she could kill or seriously injure them both. No one would find them until morning, since Jo normally rode until dark or later. Her parents had come to accept her long-range jaunts. They wouldn't be worried until midnight. Already the April sun was casting long purple shadows across the valleys of the Blue Mountains. Jo had already covered many miles in her meanderings this afternoon, elated to be back and riding the mountain roads and trails of Oregon. No one knew where she was. 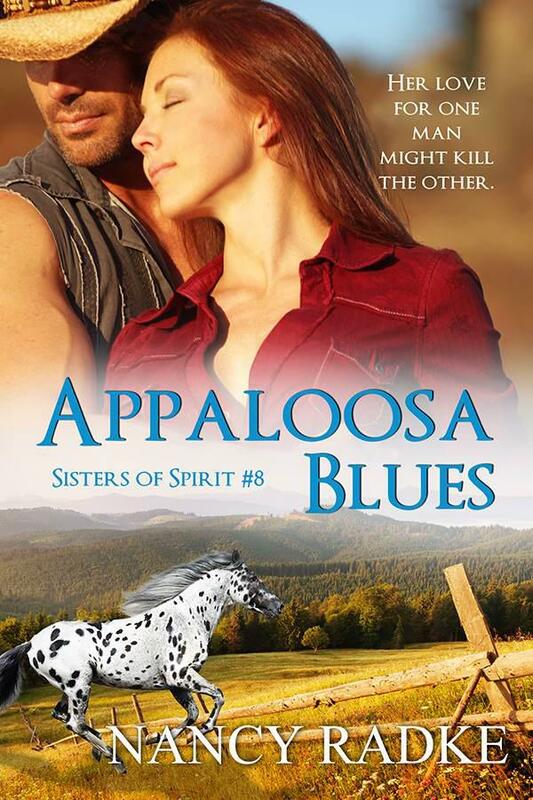 Jo could only pray that her well-trained Appaloosa would stay calm. Paca shifted uneasily, and Jo looked hopefully up the fence line towards Adam's ranch. Before her grandfather's feud with him, Adam had always extracted her from her childhood scrapes. He seemed to know where to find her...and was usually the first to arrive when she landed in trouble. She would not get out of danger sitting in the saddle, waiting for help. She had to free herself. If Paca panicked as she dismounted, both of them could be torn to shreds, but Jo saw no alternative. "Whoa. Easy girl." Jo took a deep breath for courage, bent forward, and pulled both feet from the stirrups. The mare turned her head to look back, nostrils flared. "Whoa, Paca," Jo murmured...and slid gingerly off into the looping wire. Several barbs scratched painfully up the length of her calf and another left a bright trail across her bare arm. One long loop encircled her and pulled her T-shirt up to her chin. She should have put on her jacket first, but it was too late now. Paca shuffled nervously sideways, the horse almost sitting down in fear...and the loop tightened around Jo. "Steady, girl. Easy," Jo said, trying to keep her desperate whisper sounding as calm as possible. She couldn't let her fear transmit to the horse, but her mouth felt so dry, she could barely speak. "Don't move. Please." Jo lifted the loop off her body, feeling the barbs dig into the skin on her back and side. She caught her breath as the trembling mare shifted back toward her. "Whoa, girl. Whoa. Easy now. Stand still." Forcing herself to move slowly, Jo reached down and grasped one of the three strands pulled tautly against the Appaloosa's legs. None were wrapped clear around, cutting off circulation, but the strands held the animal trapped. Jo wiggled a small section of the wire back and forth, trying to break it. Back and forth, back and forth—Jo felt the heat build up under her fingers, but the wire resisted, being too new, too strong...and there was too much of it. Only a pair of wire cutters would release Paca. The nearest ranch—the only close one—was Adam’s. It was the last place Jo wanted to go for help, since she had vowed never to speak to Adam. But Paca's life counted more than her pride. Almost in tears, Jo stroked the neck of the intelligent animal. If she had been more careful, she might have avoided the danger. "Good girl, Paca. I'll go get help. I'll be as quick as I can." Of course the Appaloosa didn't understand, but the sound of Jo's voice seemed to steady her. Jo dropped the reins. The tangled wreckage extended out several yards in each direction—most of it on Adam's land—and Jo had to fight her way through the dense brush, the wire looped through it as if to protect a military installation. Each step required care, as the springy wire recoiled on her when she least expected it. It was as unpredictable as trying to deal with Adam himself, and as sharp-edged as her grandfather's tongue. As she picked her way through the last of the fencing, Jo pictured Adam's strong features, the proud lift of his head. The older of the two Trahern brothers, Adam had inherited his rugged features from Kimana, his Shoshone ancestress—broad forehead, straight nose, prominent cheekbones and blue-black hair. From her and her Irish husband, Charlie Web, had come a love of music, an unpredictable sense of humor and an unbending pride. Therein lay the problem. Adam was proud, her grandfather set in his ways. Neither would make the first move towards reconciliation. Like the two bulls, they constantly pushed at each other. Pausing, Jo stared up the mountainside where the bulls had disappeared and prayed they wouldn't return to where Paca stood. She visualized the nearby terrain, seeking an alternate route through the brushy area that would take her to the Trahern ranch and still avoid the bulls. To meet a bull on foot was a different matter than chasing one with a horse, and getting treed by one would not help Paca. She could see no definite trail, only meandering cow paths, but knew that by following the fence line to the top of the ridge where the foliage thinned out, then turning away from the sunset, she should be able to find Adam's home. The Blues were deceptive mountains, gently rolling and not very high when compared with the other mountains of Oregon—like the Wallowas—but they were dangerous because of their similarity. The pattern of heavy growth in the valleys, coupled with bare or lightly covered ridges, repeated itself in regular sequence, forming few landmarks. People became lost easily, as many a hunter had discovered, and Jo treated the low mountains with the respect they deserved. She would follow the fence-line "trail" and hope the bulls had abandoned it. Jo glanced backward at Paca, praying that the mare's innate intelligence would keep her from injuring herself. Paca stood still as a statue, her white coat marked by the Appaloosa's spots. As soon as Jo got out of sight, she started to run. Old Levi's and cowboy boots did not constitute ideal track clothes, but the brush-covered mountain slope was not an ideal track. Roots and stones tripped her, while the low scrubby thorn bushes grasped her clothes with jagged claws. Sweat ran into her eyes and soaked her lime green T-shirt as she struggled up the rocky slope. Blood pounded in her head blocking out sound. Every muscle strained to hurry upward while inertia held her back. Refusing to think negatively, Jo pushed on. She had to get some wire cutters, that was all there was to it. Even if it meant facing Adam. Given the long twilight hours, she felt certain she would have enough light to find the way to Adam's ranch. If Gramps ever found out she had gone there, he would explode, but she had no other recourse. She didn't want to get tangled up with Adam or anything belonging to him...especially now, while she tried to help out Karen. Gramps always said the Traherns were an irresponsible lot, with Adam the worst of the bunch. Adam. A source of mixed emotions, the object of her early teen-age dreams. He angered her, yet attracted her. Her adversary with Gramps, he was also her dragon-slayer when she landed in trouble. She hadn't seen him for years. She wondered what he was like, now. Suddenly the huge bulk of Adam's young bull loomed in front of her, blocking her path as it leisurely scratched its back on one of the thorn bushes. Desperate to keep going, Jo yelled and hurled a rock at its flank. The animal spun around to look at her, and Jo dodged behind a tree, ready to climb it if necessary. Bulls killed more people than any wild animal, but she would still rather face one than Adam. "Heah! Heah! Get out of there!" The animal snorted, shaking its head, its ears twitching away some flies. She yelled louder and the bull responded this time, turning to crash through the brush for several yards before stopping again. Jo walked backward and sideways, edging past him, then continued on. She wished Adam could be so easily handled. Five more minutes and she gained the ridge. The brush was scattered thinly here, leaving large open stretches. Nearby lay the lookout point she’d been so determined to reach. As long as she stayed on the ridges, she knew where she was. Pausing only a moment to catch her breath, Jo turned her back to the setting sun and began to run down the long gradual slope towards Adam's home. Her shaky legs refused to function properly going downhill, and she stumbled and fell, skinning herself on the porous lava rocks. Picking herself up, she ran again, trying to take more care with her footing. Suddenly, Adam's home came into sight, brightly lit, with the dark shape of the barn nearby, and a man moving about in the corral. Was it Adam? She couldn't tell for certain because of the dim light and the large brown Stetson the man wore. He stood some distance from the barn. Maybe she could sneak in and get some wire cutters without his knowing it. She would mail them back...or something. Anything to keep from speaking to him. How could she break seven years of silence? She had rarely encountered Adam before leaving for college, but the few times their paths had crossed she had looked the other way and kept her lips firmly sealed. At first, anger over the bet he’d made, kept her quiet. Then time and distance widened the gap. She no longer resembled the person she’d been when she first vowed never to speak to him, but in the interim her wall of silence had become an insurmountable barrier. She felt she could not speak. The barrier was too high. If she had to, what on earth would she say? "I know I haven't spoken to you for seven years, but it's an emergency." She wouldn't blame Adam for laughing in her face. Four years older than she, he would be...twenty-seven, almost twenty-eight now. Had he changed for the better—or had the bitterness between him and her grandfather etched its way deep into his mind? The last time she’d seen him, she had been in town with her grandfather. Adam had said "Hello, neighbor," a bit sarcastically, and her grandfather had turned and walked the other way. Jo had turned and gone with him, feeling caught between the two of them, with no way out. The figure in the corral was busy, working on one of the gates, his back to her. Praying he wouldn't turn around, Jo ran closer, slipping through the wooden rails of one of the corrals, scurrying silently across the dusty enclosure, and climbing up and over the other side. A few more steps put the bulk of the barn between them and Jo grew confident she could get the wire cutters undetected. The door to the tool shed hung open and she slipped inside, pausing to accustom her vision to the dark room. Walking around slowly, she found the area where the hand tools were stored. Someone had painted white silhouettes behind each tool, so it took but a few moments to locate what she wanted. Elated, Jo took the cutters and dashed towards the door... only to collide with the solid body of the man just entering. "What the...?" His voice rose in angry protest. "Oh!" The impact threw her back and she sat down, hard, on the concrete floor, feeling the fine particles of grit that covered it. She felt embarrassed at first, then guilty—then frightened. Backlighted against the door, his face in shadow, the tall man looming over her seemed too large to be Adam. The man raised his fists. "What do you think you're doing?" Adam's voice...Jo remembered it well, although it was deeper now. Her fear left. "Who...?" Adam bent closer, the better to see her in the dark tool shed. "You! I might've known. No one else would dare sneak around here." Filled with guilt, Joanna's mind raced erratically, unable to form a coherent sentence. She felt lower than low, caught acting like a thief. It would have been so much better if she had just walked up to Adam and asked for the cutters. He scowled at her as she sat upright, his face twisting with bitterness. "I take it you hoped to come and go without being seen." He sounded angry enough to wallop her, yet Jo felt no fear. Adam was the one who had always rescued her when she got into trouble as a child. Surely he would help again— although, after seven years, he might not even loan her the wire cutters. "Well, when did you get back home? Or are you still not talking to me?" he demanded, spitting out the words as if they had a bad taste. "Huh...she's got a tongue. That must have cost you something." He removed his Stetson to wipe the sweat from his broad forehead. "So...your first day back and you throw yourself at my feet. There has to be a reason." He stared hard at her. "Well?" he demanded. "What do you want?" "These." She held up the wire cutters. "You planned to take them? Without asking?" She nodded. Guilt flooded her face with a hot blush and she felt thankful for the room's darkness. "Figures. What happened this time?" he asked, reaching down and hauling her to her feet, his strong hand encompassing her wrist. "Well?" He flicked on the light. The reality of the man took over the image of the youth she remembered. A very powerful man. One who would make a dangerous foe. Adam was burned brown from working outdoors, his broad-brimmed hat unable to protect him entirely. Sweat trailed narrow streaks on his dust-covered face and his troubled eyes held the tiredness of long hours. A dark stubble covered his squared chin, emphasizing the tight line of his mouth. "What on earth...?" His gaze roved over her, piercing as an eagle's as he examined her dirt-torn condition. "What happened to you?" His deep voice sharpened in concern. He must have spotted the scratches under the dirt. Without warning, he swung her up into his arms and carried her outside into the last of the light, sending her heart skittering in alarm. "Let's get you to the house. Couldn't you even wait a day to get into trouble?" "I didn't plan this." Even in her distraught state Jo noticed the ease with which he held her and the broad, muscular depth of his shoulders and arms, the work-hardened build of a man who was no longer a boy. "Put me down." She shoved hard against his chest. "Nothing doing." He looked around the barnyard, the iron bands of his arms effectively limiting her struggles to get away. "Stop squirming," he demanded. "Where's Paca? "I was chasing the bulls. Yours...ours were fighting in the fence between the pastures. Paca's caught in the wire. I don't know how long she'll stand—"
"She didn't panic?" he demanded to know. "No. But I couldn't get her loose. She must think I've deserted her by—"
"Where at?" he cut in sharply, giving her a small shake as if to quicken the flow of information. "At the corner. Where our pastures join." "I know the spot—you always use that gate." What he said was true. She always headed for the lookout spot in his pasture area at sunset time, if she happened to be anywhere near. Adam stopped abruptly, dropped her to her feet, and plucked the cutters out of her hand. "Stay here. I'll pick you up on the way back." He sprinted towards the barn, his long legs covering the ground in a fraction of the time she would have taken. Jo shoved back her bangs and watched as Adam disappeared inside to reappear almost immediately and enter the corral. In spite of Gramps' dire warnings about how vindictive Adam had become, Jo had known subconsciously that he would help. He might not think much of her or her family, but he wasn't the type to let an animal suffer. trigger warning extreme horror contains strong sexual content violence drug use and language.